The blog postings are about the Singapore Math. The readers can learn from the postings about Solving Singapore Primary School Mathematics. The blog presenting the Math Concept, Math Questions with solutions that teaches in Singapore Primary Schools. You or the kids can aquire the skills of dealing with Math Modeling, Problem Sum from Lower Primary School to Upper Primary School level. This posting is an Upper primary school math question on Fraction, Ratio and Problem sum. You should read the posting on Sarin learns concept of ratio in school to understand mathematics concept of Ratio and read the posting on Sarin learns the concept of Fraction (mathematics concept) to understand Fraction and Portion. 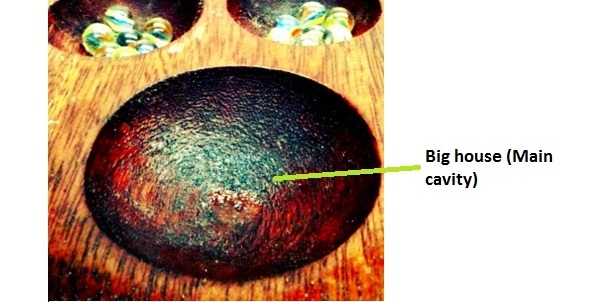 After a round of Congkak game, Fatimah has some red and green marbles in her big house (Main cavity). If she adds in 10 red marbles, 0.6 of the number of marbles in the big house will be green marbles. If she adds in 30 green marbles, 3/4 of the number of marbles in the big house will be green marbles. How many marbles are there in her big house?